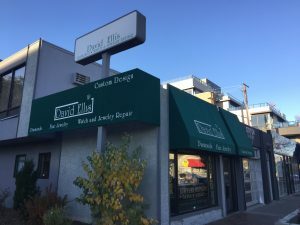 If you are a resident of Denver, CO and looking to sell your unwanted gold, silver or other jewelry for cash, look no further than David Ellis Cherry Creek. From watches, such as Patek Phillippe, Rolex, Chopard and Piaget to deco jewelry, Navajo rugs, costume jewelry and even old pottery, we buy and sell it at the best prices! Don’t worry that your pieces might not be valuable! We can appraise them for you for free. That way you can know what they are worth, and if you wish, sell them for immediate cash! Since our Colorado inception in the early 1980s, we have established ourselves as Denver’s most trusted jewelry store. We are a family business. That is why we always adhere to the family business and traditions for providing the highest quality jewelry and customer service, begun long before, in the heart of New York City. We relocated west to Denver’s City Center in the early 1980s, and ultimately transitioned to the Cherry Creek North location in early 1985. Since then we have remained a fixture of the Cherry Creek North business community as trustworthy jewelry and antique buyers, sellers, and appraisers. The Best Part is We Make House Calls! All you need to do is ask and we will be happy to oblige. We buy everything from Diamonds, Jewelry, Coins, Gold, Rolex Watches, Silver, Sterling Silver, Patek Phillippe, and more. So, give us a call today.